Iron Galaxy is a name typically associated with fighting games. The company’s most notable for games like Divekick and Killer Instinct (which they took over from Double Helix), having mostly served as a port-house for most of its existence. Extinction is the company’s latest attempt at an original project and, based on the early look we got at the show, it seems quite promising. Extinction follows Avil, the last member of an ancient order called the Sentinels who are tasked with defending humanity from the monsters that plague the world, the biggest threat (literally) being ogres. They’re giants who rampage through city streets, destroying everything in their path. Our demo walked us through an early build of the game that Avil had defend a city from an oncoming ogre attack. Smaller monsters lead the charge, each dispatched quickly with some fancy swordplay. The combat in these moments looked fast and varied, Avil quickly jumping between foes and slicing them to bits with ease, his sword beginning to glow with each strike. Combat appeared simple, but the presence of a skill tree and the inspiration they’re taking from their experience from working on fighting games, I expect the final game will provide plenty of depth to dig into. It wasn’t long after that the first ogre appeared. Slaying ogres is no easy task. Only way to kill them is through decapitation, which can only be done once you’ve built up enough energy. That energy is earned by dealing damage, by the looks of it. Until then, you have to slow them down somehow. Our presenters decided to do that by cutting off their armor so they can strike at their limbs. 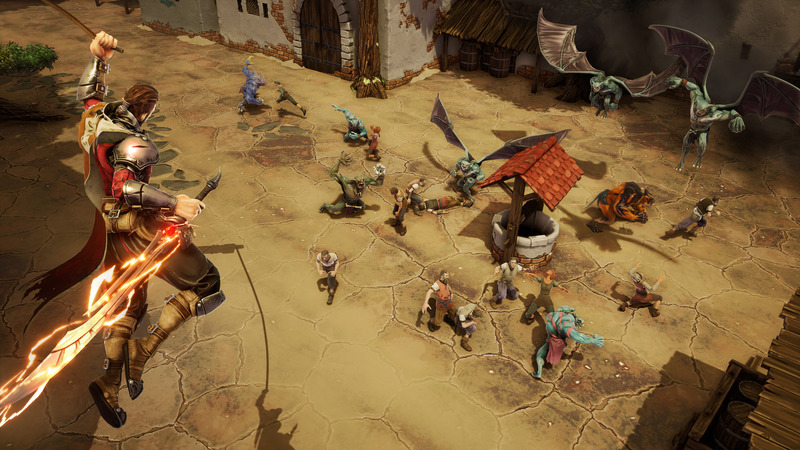 Taking out an ogre’s legs knocks them down temporarily, for example, allowing them to easily scale its backside to get in position for the kill. Only the ogre glitches out (live demo, folks) and instead of dying like it should, it just disappears instead. But whatever; it’s gone, so it’s all good. With one ogre down, it was time to move to the next one. It was advancing on the town from a different angle, requiring Avil to perform some parkour across the city’s rooftops to reach it before the ogre entered the city. The time between encounters drove home how large the area was. The developers state there will be side-missions to take on out in the world in the final game, which makes me curious to see what those missions will be and how they’ll make use of the sprawling spaces the game provides. As they approached the second ogre, it quickly closed in on a small building on the outskirts of the city. They tried to get there first to maybe slow the ogre down, but they unfortunately weren’t fast enough. The ogre stomps on the building it crumbles instantly. From there, they begin climbing up the ogre’s back rather than attack its legs, as they’ve already got enough energy to decapitate it, finishing the demo off in a bloody, gory display. Before the appointment wraps up, the developers go over few extra details. Most notable of them: apart from the story mode, Extinction will also have daily challenges and a separate “Extinction Mode” wherein you face off against a never ending horde of foes until you die. Leaderboards are also included, ensuring Extinction will have a strong competitive component. Extinction will be out on PC, PlayStation 4, and Xbox One early next year.